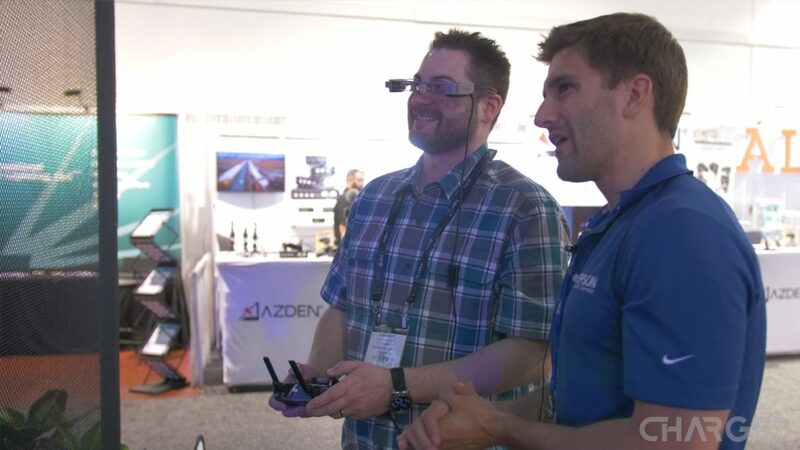 One of the highlights of the NAB Show 2017 for us was a pair of AR glasses from Epson used to assist in piloting the DJI Mavic Pro. 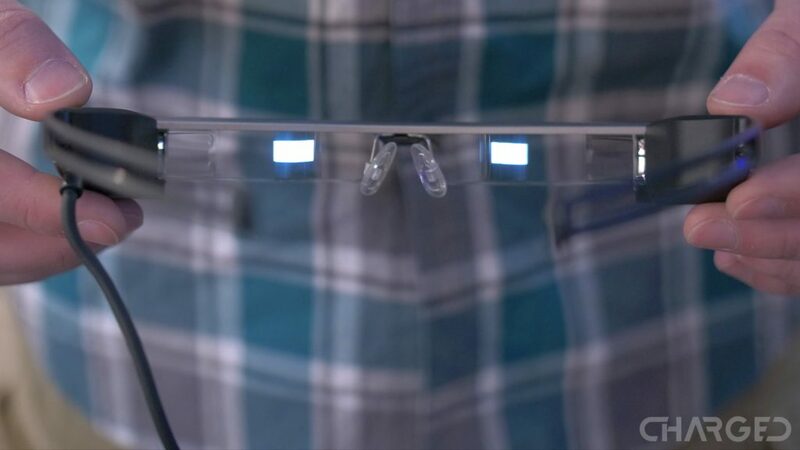 The latest Moverio glasses, the BT-300, are a slim set of heads-up display glasses that simulate the projection of a fairly small display in front of you without blocking your sight to your drone. While the idea of a FPV headset is exciting enough for DJI Mavic Pro owners, the real value is that the AR style means you can wear the glasses and fly legally. These Moverio BT-300FPV AR glasses do not break your legally mandated line-of-sight from the drone. We spent some time with Epson on the show floor. Actually, we spent half hour longer with them than I think was planned — we liked what we were seeing in the Moverio headset. Well thought out, the Moverio glasses fit well over top of my glasses, they were light-weight and easy to adjust for best viewing purposes. At less than an inch tall, it is easy to see over or under the glasses when they are on your face. Being able to see beyond the glasses, and through the display if the background is bright enough, allows you to do more than just sit and stare at the screen. As mentioned, wearing these glasses does not break your legal line-of-sight to the Mavic Pro. 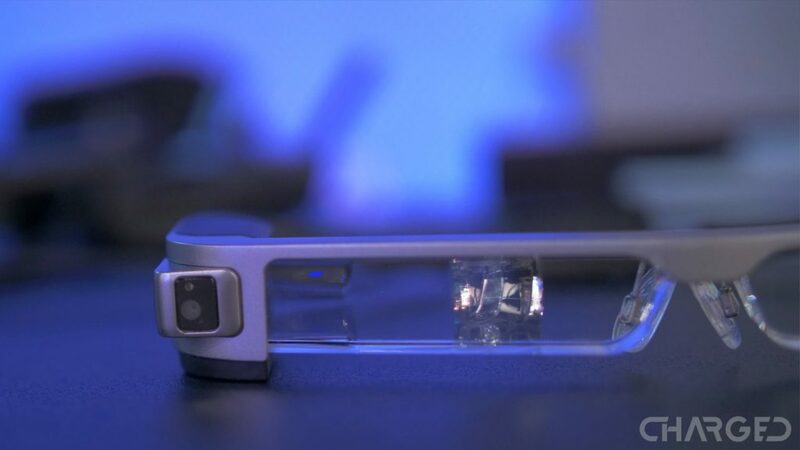 Moverio has two main parts, the glasses and a somewhat phone-sized control unit. The brains and battery live within the module, not to mention the buttons and trackpad to operate. Wires sprout out and head up to the glasses. The attached module is an Android device, able to run your favorite apps, or maybe just the hundred or so in the Epson app store. The apps acquired through Epson are your normal Android apps that you might get from the Google Play Store, they’ve just been tested for compatibility. Simply load up an app, like DJI GO 4, and off you go. Looking into the Moverio glasses at the demo presented the full DJI GO 4 app interface. The exact same software you’ve used to fly your DJI drone can be seen right in front of you, no looking down anymore. As the development community around Epson works to expand the experience, the idea is to utilize the SDK tools from DJI to deconstruct the display a little. Best of all, Epson wants contextually aware visuals on the screen. You may want just the basic flight telemetry full time, but then only see the FPV video feed at specific times. This idea can reduce the ‘clutter’ on the heads-up display, making flight safer and easier. 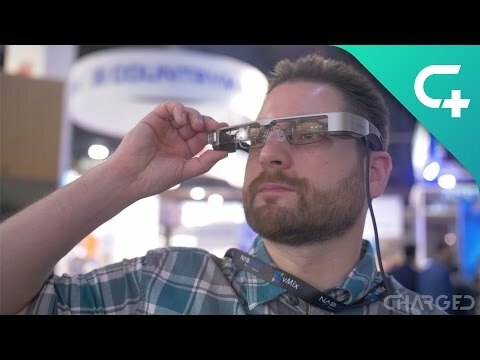 We were impressed by the Epson Moverio AR glasses. We agree that they are ready for public use, but we are more excited to see what comes next. The hardware is more than capable at this time, and the experience is great looking beyond flying a drone, but the software needs that planned update before I would fully recommend these AR glasses to fly your Mavic Pro. The drone specific glasses Moverio BT-300FPV are on sale now for $799.00. What do you think, would you rather the Epson Moverio AR experience, or the DJI Goggles VR experience?